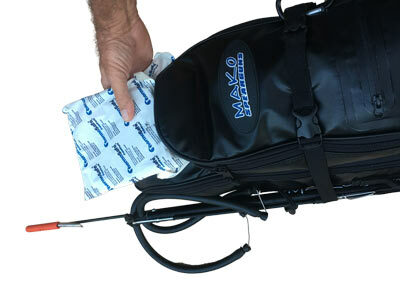 This is the must have Freediving/Spearfishing backpack for shore dives as well as boat dives. And an Insulated Fish Bag/Cooler Bag all in one! Three compartments keep your gear neatly stored and protected while in transit. Other recommended accessories are listed as follows and can be purchased on the MAKO website by following the links. Our Mini Stainless Steel Carabiners provide a quick and easy means to attach all your accessories to the backpack. Your fishing license is the most important thing you need when going spearfishing. 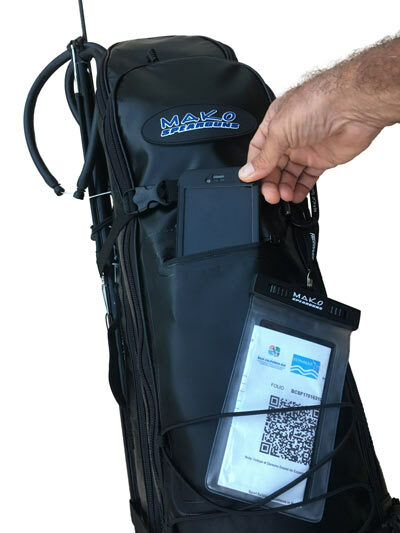 This waterproof pouch makes a perfect waterproof fishing license holder. I attach it to my dive bag so I know that I have it with me whenever I go diving. It also works well as a waterproof bag for your cell phone, but unlike our other cell phone cases, this one does not float. I got it today, looks like a quality product spent time and thought in the small details. This product shipped out quickly and arrived on time. The product is incredible and my husband was very happy! He has a ew other MAKO products and loves the quality of the company. Thanks! On my order I forgot to put my apartment number so it got sent back and I got a call from you guys immediately! I gave you the apartment number and it got sent right back to me ASAP! Everything was very easy to deal with! And I love my dive bag!